The next open SBA construction is well under way and features MW19P-8, MR13P-8 and TW29RN-B-4 drivers. A 3-way standmount in a modest sized pyramid. Final cabinets will be ready in few days and various crossovers are being tested. Should be ready for launch in May. 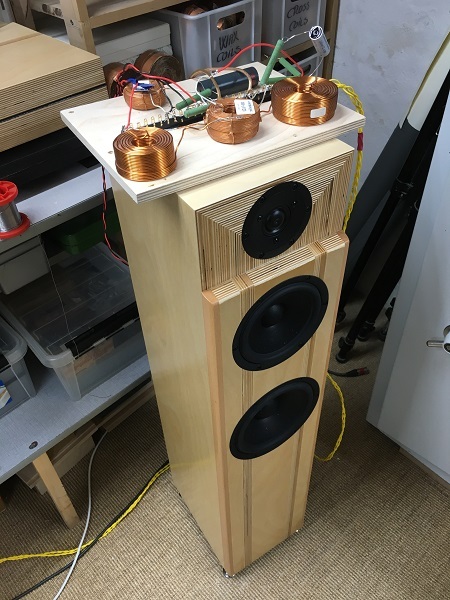 A couple of weeks ago I made a visit to Bjarne having built The Loudspeaker, and I have to admit I hadn't heard what The Loudspeaker could really sound like in a proper sized room. Bjarne has a 50 sqm living room and I would have sworn the left speaker would have problems being stuck in one corner. It didn't! And I don't have any good explanation for this except the room size may pose optimal acoustic properties where room-nodes don't at any point become dominant. Bjarne first tried the Hypex version but eventually settled on the fully passive version - and run by some 1000 rock solid Gryphon watts I've never heard anything like it. It was mind blowing! Thanks Bjarne for taking the time - and to your wife for some delicious sandwiches and cake. The winter months are certainly the busy months of speaker DIY. Numerous mails every day. Ready for launch is the STUDIO 101 mkII as soon as ScanSpeak is ready for release of the 18W/8542-10 driver. 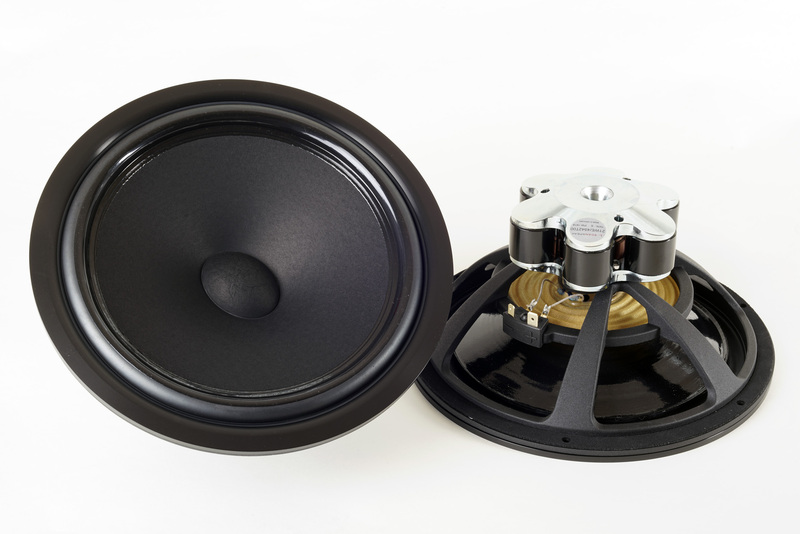 Also awaiting release is the 32W/4878-T11 bass driver for the Ellipticor-3 speaker. 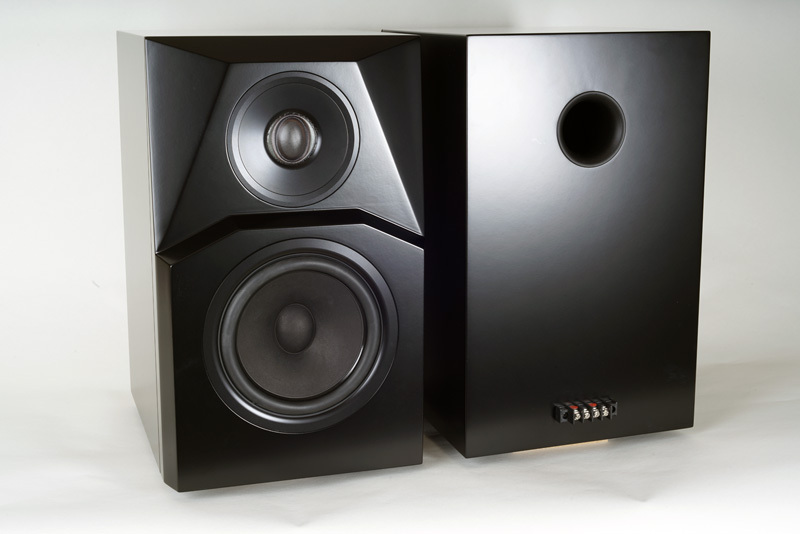 Almost ready for launch is a 2½-way SBAcoustics speaker from Satori MW16-MW19-TW029. Crossover in its final stages of fine-tuning. Easy cabinet construction and simple 1st order crossover. What has taken a considerable amount of time this winter is selling speakers to make room for new constructions. Packing speakers for transport is a daunting task anticipating all possible mistreatments, but so far all speakers have arrived at destiny undamaged. At present I only have five speakers in stock - an unprecedented situation. Thanks for cheap transport my speakers are now in Spain, UK, Germany and not least the US. The US seems a good market for my constructions. Thanks over there! An unusual amount of kits have been sold for The Loudspeaker! Never in my wildest dreams had I thought this 300 litre monster would attract such attention. I'm very pleased it does! SBA-761 and Studio 101 mkII. Thanks to all visiting my website during 2018. Thanks to those who built speakers and responded with comments and pictures of their creations. Nothing pleases me more than seeing my many workshop hours in the hands of others. My New Year Greetings to you all is the speaker seen above, the ATELL-3. Most of December went fine-tuning this 3-way speaker with SOTA drivers from Viawave, ScanSpeak and AudioTechnology. Click image to go to construction. Next in line is an update of the popular STUDIO 101 with an updated 18W/8542 driver and new and better tweeter - and simpler crossover. Also in pipeline is a 2½-way floor-stander from SBAcoustic drivers with a very easy to construct cabinet and simple crossover as well. 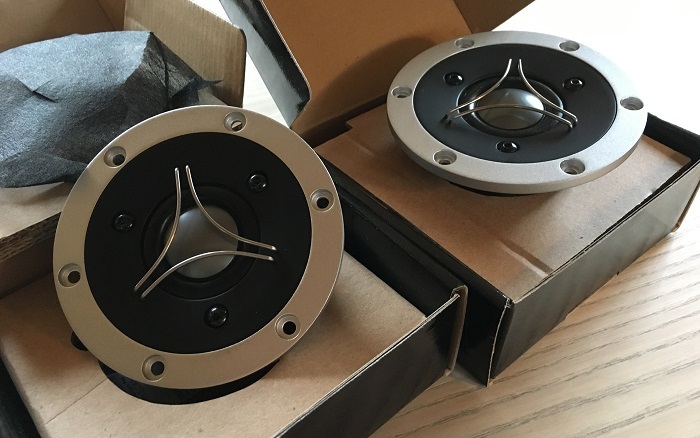 This speaker will be one of two constructions made for the new SBA website with open DIY constructions, allowing you to pick the components you like - or buy the complete kit from Jantzen Audio. The second SBA construction will be a stand-mount speaker featuring the new SB29BAC Be dome and CRC Rohacell® 6" driver. Also this will be an open construction allowing you to pick the components you like - or buy the complete kit from Jantzen Audio. In pipeline and to be launched before the end of this year are two construction featuring some unusual crossovers. The inherent smooth response of ScanSpeak Ellipticor drivers allows 1st order crossovers to be used, in fact the complete crossover is only three coils and two resistors for this 2½-way with added 32W sub. No capacitors needed. The 21WE and 18WE drivers also run without any high-pass filter and the overall simplicity pays off in unprecedented transparency and coherent soundstage. One of the few speakers I've made that made me run through a lot of recordings to hear what I have been missing so far. Client work has taken quite some time this summer and culminated with a visit to the hifi show in Guangzhou mid-September - and with an unexpected home trip delay due to hurricane Mangkhut. Guangzhou only some 100 km north of Hong Kong. Yours truly presenting a new 2½-way anniversary construction with Ellipticor drivers. In pipeline are two smaller two-way constructions from AudioTechnology, BlieSMa and ScanSpeak drivers. The AT driver is a powerful 6I52-17-06-SDT, with titanium voice coil former in a compact design supplemented by the BlieSMa tweeter, either Al/Mg or Be dome. The Loudspeaker has been sold and packing these monsters in two pallet crates is something I'll try to avoid in the future. Not easy! Packed 125 kg/ea. I'll miss these speakers badly but space is a serious issue. Later this year the FUSION/FUSION-BAD will be on sale. Fitted with the bass passive crossover and FUSION FA252 plate-amp/DSP it can be wired to run either fully passive or semi-active. To be announced later. Also for sale will be the top drivers of the Illuminator-5 including the crossover for mid-upper-mid-tweeter. To be announced later. Spring and summer has been unusually hot here in Denmark and doing cabinet work on the Ellipticor-4 has been slow, but here they are. For the size, I believe the best 4-way I have ever build. Building this type of cabinets is tedious, and having built four others in the same design doesn't leave many challenges, except for the panel cutting. Cutting Baltic birch and having the final finish in one is demanding, but seeing the finished cabinets I'm pleased and its worth all the hours. The rear firing tweeter is optional and I'm still experimenting. Seems good on some recordings and less on others. It provides some additional airiness to the sound, but also a more diffuse treble presentation. I'm currently experimenting with an insanely expensive copper foil cap for the tweeter - and it's really, really hard to hear any difference to the default Alumen-Z capacitor, but a certain recording having a forward sounding clarinet, seems a little smoother than it use to be without loosing transparency. I've done A-B test for guests and mostly they couldn't hear any difference. Fine-tuning speakers never end. This is the holiday season for most people, and I wish you all some relaxing weeks - and maybe some panel cutting. Much to my surprise, The Loudspeaker has caused much more attention than anticipated. Building a speaker of 300+ gross litre was something I just had to do without any expectation of public interest. Visitors have been many and apparently there are quire a few out there with a favourable WAF situation and not least being tired of speakers not delivering the dynamics of real world music. 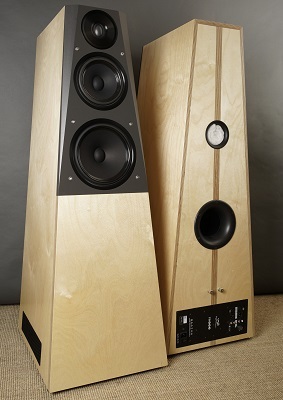 I won't reiterate the virtues of large speakers like these, only pass on the notion made by visitors that treble from a hornloaded driver is something else and in this case as far away from "PA sound" as can be. "Horn treble" has a bad reputation, but from quality drivers, well designed horns and properly tuned crossovers, it can be as smooth as should be and leave conventional direct radiators behind. Having a new reference obviously add pressure on the smaller speakers from my workshop, and few drivers have excited me more than the new line of Ellipticor drivers from ScanSpeak. As said in the very first article on Ellipticor, Ellipticor 1, it takes time to get to know new drivers, their strengths and limitations. Fortunately client work has added deeper knowledge and given me new ideas. Clients may suggest things you wouldn't dream of and sometimes lead to new ideas for future constructions. Currently I'm testing the new 8" Ellipticor drivers, 21WE/4542T00, to find out what I can make from this driver. Can it be used in a simple two-way or how about an 8+6+1 Ellipticor? Time will tell, but preliminary test suggests a potent bass, transparent up-front midrange - and it can be run from a single coil delivering a 2nd order roll-off. 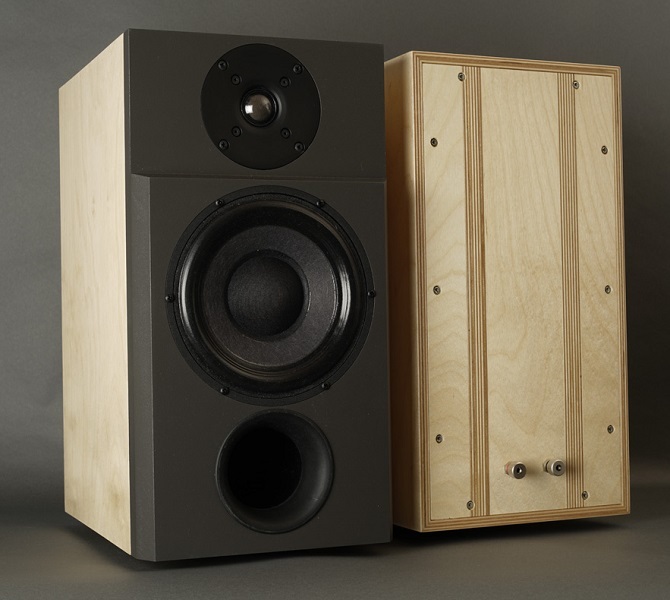 I'm still in the final construction phase of the Ellipticor-4 making the midrange and treble cabinets. Bass module is finished. These last two winter months have been busy and lots of good stuff in pipeline for launch over the next month or so. To the left a speaker to end all speaker building - if you have the space! 307 gross litres is what it takes to get very very close to what live music may sound like in your living room. 18" BMS bass driver is just the right size to give a kick drum or a double bass the weight and punch of the real thing. 10" midrange driver and a compression driver delivering as smooth and transparent a treble as can be. Not show is a super-tweeter on top handling the upper octave, 10-20 kHz. None of the drivers ever work hard to deliver thunderous sound levels should this be needed. A normal listening level the cones hardly move at all. Extremely low distortion! Go to The Loudspeaker website. To the right a new 4-way speaker that is already a serious competitor to my ATS4-HE speakers. My ATS4-HE prototype cabs her holding the ScanSpeak Ellipticor drivers on top and 10+12" bass drivers from 18th Sound and BMS. System is tuned to 92 dB and is ~100 gross litres more acceptable, you get and midrange presence and treble transparency similar to the monsters to the left, only not capable of playing as loud. Setting up the Ellipticor drivers in cabs similar to the ATS4-HE was almost plug'n play. The 18WE driver, here used for midrange is as smooth as can be and crossover is extremely simple. The D3404 tweeter does well with a tweeter baffle similar to the ATS4-HE and again, a very simple crossover. I won't have time to make the final Baltic birch cabinet before launch, but construction is finished and will be launched shortly. Construction launched. Go to website. 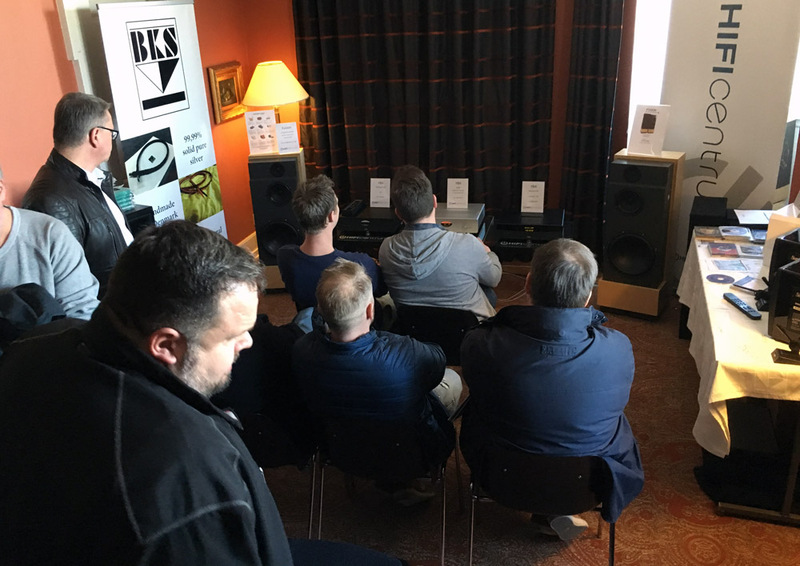 Thanks to Lars Frandsen, HIFIcentrum/Middelfart, space was offered for displaying the FUSION-BAD at a local hifi show. Speakers were driven from YBA IA350 amplifier and speaker cables were pure silver from BKS (no website). I think quite a few visitors were surprised to see DIY at a hifi shown, and to my recollection finished DIY speakers have never been displayed like this before. Maybe back in the Eighties, but not sure. Anyway, it was a great opportunity to present and demonstrate the speakers and the Jantzen Audio Kit. Response was positive. Quite a few never considered the possibility of cutting MDF, heating up the soldering iron and building something with a solid bass response and significant sound stage - and NOT paying a minor fortune! One of the many things I learned from the show, was to remember having some 20 cm stands for the speakers. Chairs are too high and few people never had an opportunity getting into proper listening positions like sitting in your sofa at home. Standing up and you're even further away from auditioning speakers properly, although we often have to due to the number of people present. Moving your speaker into a hotel room is kind of gambling with regard to acoustics, but thanks to all the stuff present and people not least, acoustics were better than anticipated. All in all: Great fun! Above a picture from the window of the local HiFi Klubben store. 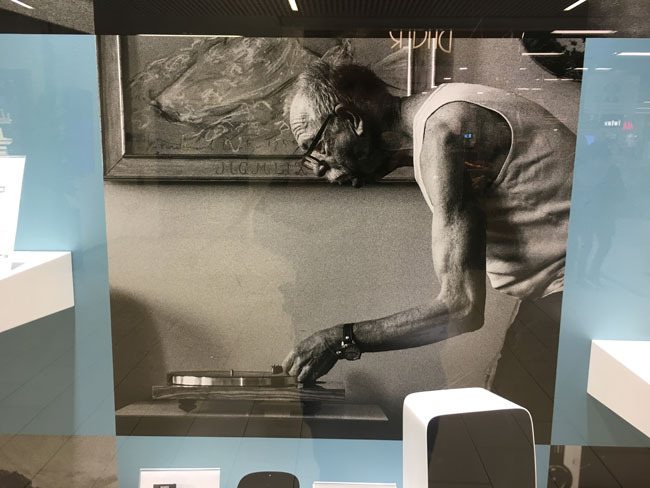 Appears they think vinyl aficionados are old farts with shaky hands and just risen from a - hopefully - good night's sleep... From a marketing perspective, this may not exactly encourage young people to get involved, but who cares? Vinyl lives its own life and is doing well. Have an audiogd R2R 1 DAC for testing for the time being. This DAC certainly brings new life to my 24 bit files. I'm not saying you have to be a digi geek to get this DAC going, but it helps. The manual is a disaster and I recommend reading this 6moon review of its larger sibling to get an idea of what you may have to go through. Have to say that a recommended 1000 hours of burn-in is ludicrous. When it comes to the sound of the R2R 1, I highly recommend you take a listen. First of all, Happy New Year to all who visit my website! 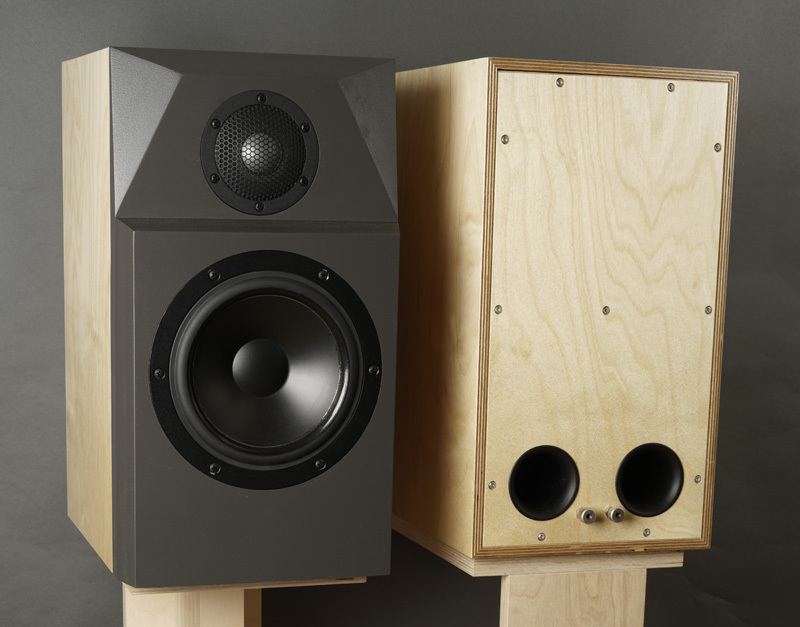 Primary focus this January is the launch of ATiRi and Ellipticor speaker kits. Jantzen Audio is awaiting drivers from the manufacturers and as soon they become available, the kits will be launched. Next in line is the final touch to the FUSION speaker. Front grille and a version featuring the Hypex PSC2.400d module, running the bass driver including its 200 Hz low-pass filter section. This will be ready before the end of January. In pipeline is a book-shelf speaker. Yes! First construction meant to be placed on a shelf up against the front wall. Quite a powerful 3-way from 8+4+1 inch drivers. Placing a speaker up against a wall takes special precaution in designing the crossover as we have a significant bass-lift from such placement, meaning from lower mid to treble, the level must be higher than normal to balance the overall sound. Apparently I should communicate more often here. Have mails asking if I'm still "there". Indeed so, but house maintenance, holidays, etc. has keep me busy. And please do not expect a new speaker construction every month. This is way above my capacity. Another thing that has keep me busy is selling speakers. This takes time! With the output over the last year it has taken considerable time to get rid of the speakers again. All speakers must go at some point in time. I live in a small house and can only accommodate a fairly small amount of speakers and the bigger ones are hard to stove away - and sell. Few people buy seriously expensive speakers. New constructions are in the pipeline. Still waiting for the final Ellipticor tweeters to finish off the construction. Hopefully before too long. Another smaller two way in pipeline with exiting new drivers. Finally a larger classic 3-way from 12+6+1. PLEASE do not ask for details. Nothing will be revealed before they are finished. When not occupied with other things, I've immensely enjoyed my Ekta mkII driven by my EAR-861/32wpc power amp. Read below. I'm very pleased to launch this new and up-dated Ekta. Click image to go to page. The first Ekta dates back to around 2005 and many times I wanted to update this construction based on a client job and not taking into account an optimal front panel design. The result was a 4th order filter to the tweeter and even a notch filter to tame a 7 kHz peak creating quite some sibilance if not attended. I believe I can do better today by combining design and acoustics at the very beginning. And not only that, I think I can make a more sensitive speaker, better bass, better power handling, better midrange, a better sounding treble - and not least, at lower price! 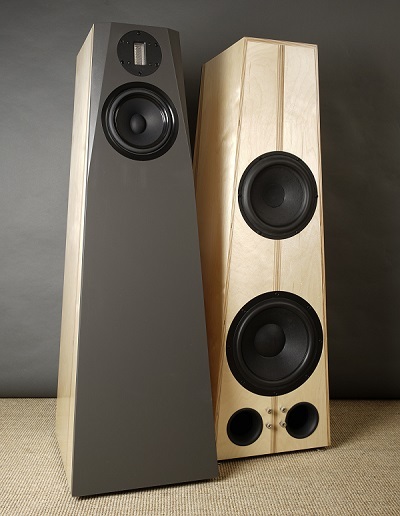 The latter due to the use the the D2608/913000 tweeter, which is kind of an overlooked tweeter, originally derived from the Peerless HDS series. There's a lot of money to be saved from not using the 7000 ring-radiator. The money saved can be used on better crossover components. The 9130 tweeter simply delivers top-notch treble performance with its double magnet, die-cast face plate, low-mass diaphragm, low Fs, etc. Running the Ekta mkII from my EAR 868 pre-amp and modded EAR 861 power amp makes one hell of a system. I'm afraid I have to keep the Ekta mkII as a reference for a modest sized and slim 3-way floorstander. 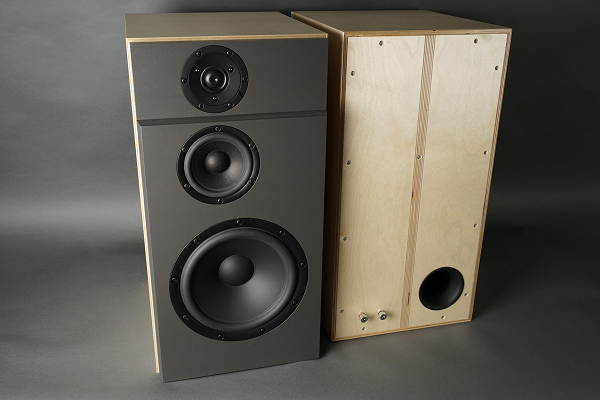 Based on feedback, the NOMEX-164 is one of the most popular speakers in my portfolio. The mkI dates back to 2010 and with the experience gained since then it's time for an update with some modifications allowing a simpler crossover and a lower point of crossover. The speaker now features a better sounding time-aligned 2nd order filter. The NOMEX cones still deliver some of the best midrange money can buy and the 9130 tweeter a treble that ranks among the very best. With 90 dB sensitivity and an easy load, this speaker can be driven from low-wattage/high-quality amplifiers. Moving the speakers to my living room and setting up the speakers next to my reference ATS4-HE one might expect some serious shift in quality and some mental adjustment. Not al all! All I can say is that I fully understand why some people would question the rationale in investing some 10 times the money for the ATS4-HE compared to NOMEX 164-mkII. Yes, we pay dearly for small increments in quality. No, the NOMEX does not have the low-end weight of the ATS, but nevertheless a solid bass presentation and magnificent midrange and treble. Feed them the best source material you have and they will deliver. These speakers can be fully driven from my 32 wpc EAR 861 tube amp. The last three months have been very busy. First and foremost due to two new constructions made for ScanSpeak to present their new drivers at the Munich High-End Show, 2017. A classic 3-way featuring the new 11" bass driver, 28W/4878T00, the new 8 Ohm Revelator midrange, 18M/8631T00, and a 2-way stand-mount from brand new Ellipticor drivers. The latter not least exiting due to elliptical voice coils, something never seen before. I very much look forward to more constructions with these exiting new drivers. The 2-way presented in Munich will be launched as a kit around November 2017. Already around Christmas 2016, the new ATS4-HE was initiated and finally launched a couple of weeks ago. This is the most ambitious and expensive speaker I've ever made - and has brought me closer to the live performance than anything else I've ever had i my living room. What characterises two of the new constructions is the use of DSP/plate amps for the bass driver(s). I've used bi-amping for several years but the plate-amps featuring DSP is just simply the way to go for larger speakers. It allows rock solid and deeper bass from smaller speakers - and it allows people to adjust bass level to fit their often less than ideal room acoustics. So much needed! I haven't made any statistics, but I think there were more constructions this year in Munich featuring plate amps for the bass drivers than last year. I'm sure it will catch on and be standard for larger speakers in the future. Hypex is launching a wider range of DSP/plate-amps, Fusion, later this year and I'm looking forward to learn their new products. So, why not full DSP and digi amps for all drivers? Simply because what I've hard from digital amps and DSP simply doesn't match the quality of the best of traditional solid state/tube amps and good quality passive crossovers. Our attic has been stuffed with speakers, and a few weeks ago I launched a summer sale to make room for new constructions. Fortunately four set of speakers have already been sold. The Illuminator-4 is still available and it will probably take a bit longer as it is not exactly cheap, but a kit price of 3900 EUR + cabinets materials + 250 hours of work doesn't come cheap. I really hate to let go of this speaker. It's a darn good speaker and the best woodwork I've ever made. Hopefully it will find a room somewhere delivering what it is capable of. It deserves the best equipment you can buy. Buying stuff is usually a matter of a few clicks. Selling stuff takes time, a lot of time! Typically 20-40 mails back and forth before a deal is final, money transfer and thorough packing to ensure safe arrival. It's been a long wait for the SBAcoustics Beryllium domes - and it was worth the wait. Standard testing can be found here. Implementing these domes in three of my SBA constructions was easier than anticipated, as frequency response and sensitivity is so much alike the TW29RN tweeter that no changes to the crossovers were needed. At around 300 EUR/ea, they should reach a wide audience. Can't believe how good domes we have these days!